The boating season for 2015 was at an end so we were looking forward to Easter 2016 where you could have a three night break from just £66 per person. 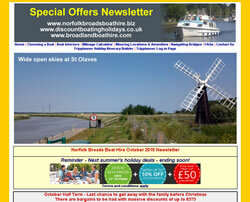 Our featured destination this month was the small town of Stalham on the River Ant. If you are starting from or just intending to visit Stalham, take a look at our guide for things to do, places to visit and a directory of services available in the town. The "Book 2016 at 2015 Prices" offer ends on the 31st October though the £50 low deposit carries on for now. We suggest a taking the family away on the last school holidays before Christmas (October Half Term). Discounts of up to £155 were still available for the break. Early bookers were able to make good savings as 2016 bookings were on sale at 2015 prices by paying a low £50 deposit. 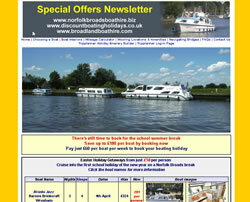 Also, many boatyards were offering a 5% early booking incentive to lure early bookings. We highlighted the Lowestoft Water Taxi which was currently offering harbour cruises around Lowestoft and Coltishall featured in our town and village lowdown for this month. There were huge savings to be made on holidays starting around the August Bank Holiday with discounts of up to £373. With the arrival of the busiest two months of the year, we were highlighting that our live music and other events pages were detailing over 70 entries for August and September. 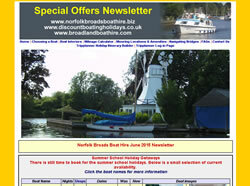 Ludham, at Womack Water was the village featured in our town and village lowdown. The August school holidays were starting to book up fast so we highlighted a number of boats which were still available and suitable for a family holiday. Swancraft in Brundall had announced they were to cease boat hiring at the season's end and this month's spotlight fell on the picturesque village of Horning. 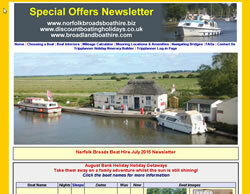 This time, Spring Bank holiday was just a few weeks away but there will still time to find a discount of £339 on Norfolk Broads boat hire. Our village lowdown centred on Reedham. We advised the best way to moor and highlighted the bars, shops and other attractions available to you. Finally, we advised that our live music page now included May and June dates. 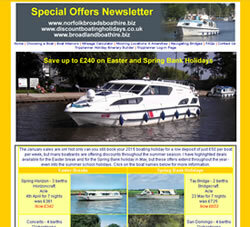 With Easter being just a month a away, the newsletter featured holiday getaways on the Norfolk Broads in early April. 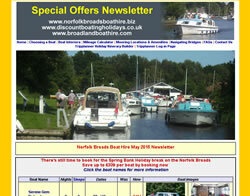 You could hire a boat from just £50 per person over the Easter period. Potter Heigham was the next centre to be featured in our town and village lowdown and we relaunched our "Live Music and other events" page for the summer. Amazingly, you could still save up to 20% on August school holiday breaks with one boatyard offering discounts of up to £265. 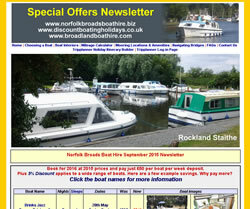 The low deposit offer was extended meaning you were still able to book for £50 per boat deposit. 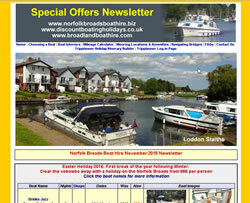 This month we featured Wroxham - the "Capital of the Norfolk Broads". We highlighted local attractions, where to eat and drink and other local services. January highlighted the offers available for those wanting a break either at Easter or the late Spring Bank Holiday in May. 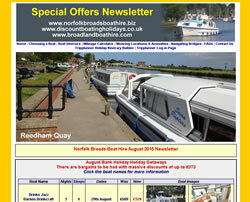 For those people who travel by train to hire a boat on the Norfolk Broads we included a guide to the nearest rail stations, distances to the boatyards and options such as taxi travel between the arrival station and the holiday start point.